"My Story" is an open text box that appears at the top of your RIA Match Profile available to paying subscribers and viewable by all subscribers. You are better able to tell your firm’s story and value proposition. 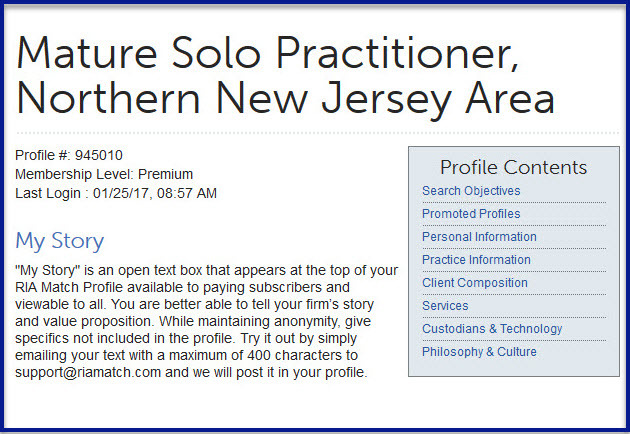 While maintaining anonymity, give specifics not included in the profile. A maximum of 400 characters. How does it get posted? Email us your text at support@riamatch.com and we will post it in your profile. We are seeking new M&A partners. We are experienced buyers with a national brand and more than $1 billion in AUM looking to expand in new cities. We provide an extensive technology platform, back office support and marketing. Our holistic client experience starts with a financial plan. Our investment philosophy is primarily passive with some alternatives. Send us a message, let’s us help you grow. Let us be your Succession Plan. Join our fee only RIA, keep your clients and your DBA, continue with your own investment philosophy. As a member of a larger RIA, you will get better custodial service and lower technology and compliance costs. We provide marketing, scale and a strong firm story. Grow with us. Send us a message; let’s see if there’s a fit. Let us be your Contingency Plan. You have a successful practice and want to remain the owner of your RIA so you can keep growing but you need a contingency plan in case you are hit by a bus. We get it. We act as other firm’s contingency plans so we can share with you what has worked for us. Send us a message, let’s start the conversation and see if we are a good fit. Join Our Firm. We want to add experienced advisors to our hybrid RIA. Join our RIA and move into our available office space with your siloed practice. Pay a fee for office space and shared costs. We work with multiple custodians, an accommodating bd and insurance companies. We have strong technology and compliance. We collaborate on challenges and ideas. Send us a message let’s see if we are a good fit. We need a NextGen. Help our team prepare for client meetings, gather and update necessary client information and gain exposure to the various team roles. We are a fee only RIA that offers a well- defined career track, a full benefits package and mentors. CFP track candidates preferred. Send us a message! We are beginning to explore a possible sale of our firm. Our ideal buyer would be local and aligned with our active investment philosophy. The client profile between the two firms should be similar. We have 2 staff who know our clients well and we would like to stay for a couple of years. While price will be important, philosophy and culture will drive the deal. Send us message. I am a Virginia Tech Financial Planning Graduate seeking a permanent position. Graduating in May 2017, my studies focused on financial planning and asset management. I won the 2016 FPA Student Financial Planning Challenge Contest. I am willing to relocate. Looking forward to entering the industry. Send a message and I will respond quickly. We are committed to bringing you solutions for the succession and growth of your firm. If you have any questions or if we can be of help, please feel free to give us a call at 571-252-3247.